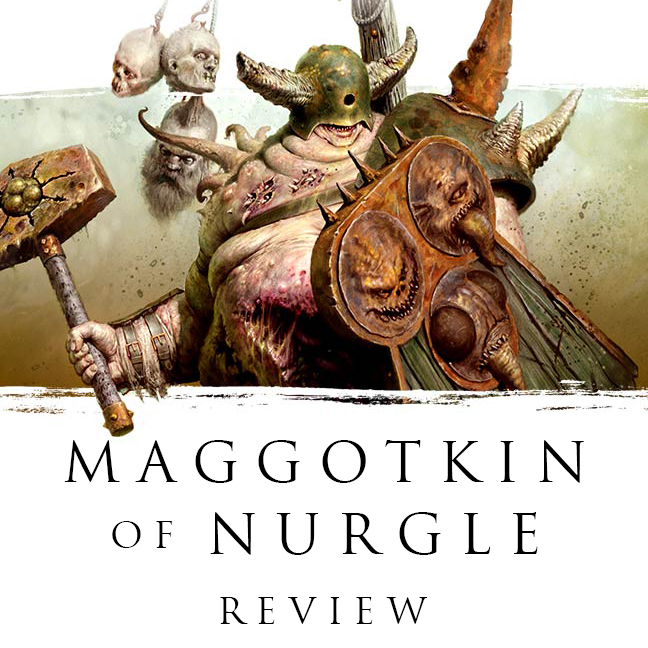 The newest Battletome for Age of Sigmar is finally here, and with it are the forces of the Maggotkin of Nurgle! What does the latest Chaos tome hold for us? I know I say this with almost every Battletome release, but check out that cover. That is a nice piece of artwork for the cover of the book. In my opinion, it strikes a nice balance between the covers we've been seeing from AoS so far, as well as the older style from 8th edition. I think it definitely has a grittier feel to it when compared to some of the glossier AoS covers, but the whole art aesthetic has been moving back towards that style for awhile now, which is a change I approve of. Warhammer has always been gothic and dark, even when not set in the 41st millennium. From a design point of view, I really like what they've done with the rest of the cover too. That new AoS logo looks great on it, and again, harkens back to a darker feel. I'm excited to see it used on more stuff as we go forward. The font and layout of the title is different too. The letters are less blocky and more spaced apart, while the decoration around the "Chaos Battletome" designation is now a simple white line instead of the Chaos arrows. I wouldn't be surprised to see this on future battletomes across all of the Grand Alliances. All of this combined gives the layout a more elegant and refined feel in my opinion. Even the background image on the spine and back are slightly different with more of a white tone as well as those lines we've been seeing since the Malign Portents teasers started. To me this all gives the book more of an "adult" feel, while the previous, brighter and blockier look, had more of a pulp feel to it. Neither is bad, but I definitely like this look more. Sorry for the essay derailment into design and layout, I do design for a living, so I look at these types of things a lot. Once we open up the book itself we dive right into the lore. The first bit describes Nurgle himself, and has probably my favorite piece of artwork from the book, with Rotigus front and center. After that we go into descriptions of Nurgle's demons and the Garden of Nurgle. If you're familiar with the lore for Nurgle already, a lot of this will be retreading things for you. That being said, there is definitely new stuff in here, and bits and pieces pertaining more to AoS and the current timeline. We delve into Epidimius and Slimux a bit, as well as how the demonic legions are summoned into the Mortal Realms. It also goes over what happened to Nurgle following his force's defeat at the All-Gates and why he is now making a resurgence. After this it goes over his mortal followers, the Rotbringers. Here we get new information, since not much had been written about the in AoS before. You learn about how and why people turn to Nurgle and how they become the mighty warriors known as the Blightkings. This is followed by descriptions of how the demonic and mortal armies of Nurgle are organized, with charts like we have seen in most of the other Battletomes. Instead of having a bunch of example color schemes laid out with little description, we get three examples for each faction, demonic and mortal. I really like the illustrations here and they are definitely much better then the line drawings we used to get. Each example army gets about a paragraph's worth of description, as well as what their symbol is. I like the Befouling Host the most, and based my Nurgle scheme off of that. The symbol for Gutrot Spume's legion is the coolest though, with a trident overtop of the Nurgle symbol. We also get the "space timeline" as people call it, with a bunch of example battles. This starts with a brief description of the Age of Chaos, but that is swiftly followed up by the defeat at the Genesis Gate so that everything else on the timeline is all new information. One of the coolest to me is the Maggot Pit, which involves the resurrection of a certain character who seemed dead and gone before. Next are the individual unit descriptions. Again, for the demons a lot of this is rehashing old information if you're familiar with it already, but it's great for new players. We also learn a bit about the two new heralds as well as Rotigus. The mortal part is the most interesting to me, since we get to see how some of the characters are handled in AoS who were first introduced during the End Times. The Glottkin have pretty much the same backstory, with it mentioning how they might be from the world-that-was. The Maggoth Lords and Festus also seem to retain a lot of their previous backstory, but without explicitly mentioning they came from the Old World. The one character who got revamped is Gutrot Spume. This one struck me as a bit odd, since his backstory is more or less the same, but now it happened in the Mortal Realms at the start of the Age of Chaos. This strikes me as weird since he is now the only carryover character from the old Warhammer world who has had their backstory re-written. It's especially odd since his name is the same, and during the End Times he fought alongside the Glottkin and the Maggoth Lords, who didn't get re-worked. The new heroes like the Lord of Blights also get explored, with the description for the Putrid Blightkings being my favorite. Even though they are hulking warriors, many of them were well educated men in their past lives, so it talks about how they'll discuss poetry and philosophy and things like that. It's a pretty stark juxtaposition with how they look. The artwork throughout this is pretty solid, but the one thing that bothered me slightly is that a lot of it is reused from previous books. A lot of it is actually from the End Times Glottkin book, which struck me as a little odd since there was so much Nurgle based artwork done for the start of Age of Sigmar. It's all really good art though, and for the many, many new players who have joined the game since AoS launched, all of it will be new. The art that is brand new to this book though is pretty stellar, with the Rotigus one from the front being my favorite. The middle section of the book shows off all of the models, and they're certainly good looking. This is nothing new, but it's still nice to look at and take inspiration from. Now, onto the rules. The Nurgle Allegiance ability is the same as what we saw from Blightwar with the wheel, called the Cycle of Corruption. There are seven potential bonuses for you, or debuffs for your opponent, and on your first turn you roll a dice. That's the bonus you start on (so you can never start on seven, which is heal D3 wounds for every unit in your army) and then the next turn you move onto the next bonus on the wheel in a clockwise fashion. This is a pretty cool idea, and definitely gives you more incentive to pick up the Blightwar box since it'll be easier to track with the wheel it comes with. Some of the other bonuses are increased movement for your units, a buff to wound, and debuffs against your opponent to wound. Alongside this you also get to set up a Feculent Gnarlmaw for free before you picks sides. This is a new terrain kit that gives you some bonuses. Any enemy unit that stray too close to it can potentially suffer mortal wounds, but the big bonus is that any of your units within 7" of it in the charge phase can charge even if they ran that turn. This definitely gives your army some more mobility considering how slow Nurgle is. The last entry in the Allegiance ability section is the new system for summoning Nurgle units. Nurgle demon units no longer had the summoning rules on their warscrolls. Instead, each turn you earn contagion points, which can be used to summon on a unit. Contagion points are earned by having units in your own deployment zone, your opponent's deployment zone, by having Gnarlmaws with no enemies nearby and a few other ways. You get these during your hero phase, and they accumulate over the game. Also included in this section is a list of the summonable units in the army, and how many contagion points they cost. For instance, at 7 contagion points you can bring on another Gnarlmaw (which costs 0 points), and at 28 points you can bring on a Great Unclean One. These are deployed at the end of your movement phase within 12" of a hero or a Gnarlmaw and at least 9" away from an enemy unit. It's a pretty cool way to summon, and gives Nurgle its own Blood Tithe-esque system. Just like the other two Chaos books so far, there are three sets of command traits you can pick from, one for Rotbringers, one for Demons, and one for Mortals. Each of these share the same three initial traits, and then get three unique ones. One I expect we'll see used a lot is Grandfather's Blessing, which lets you move the Cycle of Corruption one stage forward or backwards, once per battle. There are other good ones in there as well, but just like with other Battletomes, I'm sure we'll see a select few used more than others. The Artifacts are also divided up between Rotbringer, Demon, and Mortal, but each of these get their own unique six. A few of the ones I really like are the Witherstave, which forces enemies to re-roll hits of 6 while within 12" of the hero (goodbye Retributor mortal wounds) and Rustfang, which lets you pick an enemy unit within 3" and subtract 1 from their armor save for the rest of the game! The spell section is a little unique, in that each mini faction only gets three spells a piece instead of the usual six. I imagine this is because Nurgle isn't that well known for magic. To compensate though, all Nurgle sorcerers know the Foul Regensis spell in addition to one from their lore. This lets you pick any stage on the Cycle of Corruption and immediately reset it to that. As you can see, there are a lot of way to manipulate the Cycle. Another one of my favorites is Blades of Putrification, which you cast on a friendly unit, and any rolls of 6+ to hit inflict a mortal wound alongside their normal damage. On a unit of Putrid Blightkings this would be a pretty awesome spell. Before we move onto the units we get the Path to Glory campaign rules for the Maggotkin. This is just like what you would expect considering previous Battletomes. There are a bunch of tables for your followers as well as your leaders, and reward tables for both as well. There is also a unique Battleplan for the army here, which has you fighting to infect the land. Instead of starting with a Gnarlmaw or being able to summon one, you must infect three designated areas on the board, and when you do they turn into Gnarlmaws. It seems like a fun narrative scenario and one I would like to play at some point. The warscroll battalions are divided up into Demons and Rotbringers, each getting three a piece plus one mega battalion each. The Demon ones contain the Tallyband of Nurgle, which has been around for awhile, plus my favorite, a battalion consisting of three Great Unclean Ones, and a battalion centered around Slimux and Beasts of Nurgle. The Rotbringer ones honestly seem like the more powerful ones to me, but their points costs reflects this as well. The Blight Cyst battalion gives all of your Putrid Blightkings in it -1 rend to their weapons and you ignore cover saves for the enemy models as well. That's insanely good, but it also costs 220 points, so be prepared to center your army around the battalion. The mega battalions each focus on a specific army, kind of like the Stormhosts or Wargroves. For the Warscrolls, there were a few tweaks here and there to existing ones, but for the most part, a lot of them stayed the same. All the Demons lost the Summoning rule since there is now the Contagion points system, and others got better, like the Beasts of Nurgle. The Great Unclean Ones got a whole new warscroll to better reflect their new model, and it's pretty good in my opinion. You have options on what weapons to give them too. You can make it so they're good at dealing damage with the Bilesword, or give them the bell and buff the movement value on surrounding Nurgle units. There is of course new Warscrolls for the brand new units, like the Lord of Blights and Pusgoyle Blightlords. These all look pretty fun to play, with the Lord of Blights standing out to me. I like the Pusgoyle Blightlords as well, and they add the speedy unit onto an all mortal army. Remember, the Maggotkin book encompasses any unit with the Nurgle keyword, not just what's in the battletome. That means Slaves to Darkness units with the Nurgle keyword, but also Skaven Pestilens, including Plague Catapults. I'm already trying to think up lists using these, but you'll be hard pressed for points. Everything in here is pretty pricey and you'll quickly find your force filling up. That's not a bad thing though, as it all feels fairly balanced to me and it makes for a potential "elite" army if you want low model count. Since it's Nurgle it can be fairly quick to paint as well. I'm definitely very tempted to start an army based off this book. I already have an old all metal Nurgle Demon army for 40k, as well as an old metal Death Guard army. I think it may be time to give Grandfather Nurgle another shot. All in all I really liked this book. It delivered everything I wanted for a Nurgle Battletome. The background lore is great, and the new models are amazing. Like I said before, my only gripe is that so much End Times artwork got reused here. It's a small complaint in an otherwise good book. I'm sure we'll be seeing a lot more Nurgle armies on the table soon. If you play Nurgle already this is definitely a must buy, and if you're an AoS completionist like me you'll want it as well. It advances the overall narrative a little bit, but mostly only related to Nurgle stuff. Now, put that vile soap away, and get cracking with some Nurgle goodness.